Often it’s when you talk to people that you know about your own biases. For example Leah, the bubbly owner of Cha Thai, shows me the prices on her menu, and then states exactly what I was thinking, that these prices are a little dizzying for Thai food. Singaporeans, she explains, have been influenced by the prevalence of street food into thinking of all Thai food as being cheaply priced. Well, I’m guilty as charged. In my feeble defence, I might have noted that Cha Thai’s decor doesn’t exactly scream fain daining - which I mean as a compliment; with its blond wood tables and lighting that allows you to actually see your food, it’s a relaxing spot, the sort of place you go to for dinner with friends. The food, however - while also simple, casual, relaxed and other such words - is also food with real quality. Leah starts off with a little talk on the regional variations in Thai cuisine, of which Singapore is only gradually becoming more aware - for example in the uptick in places serving food from the Isan region in the northeast. 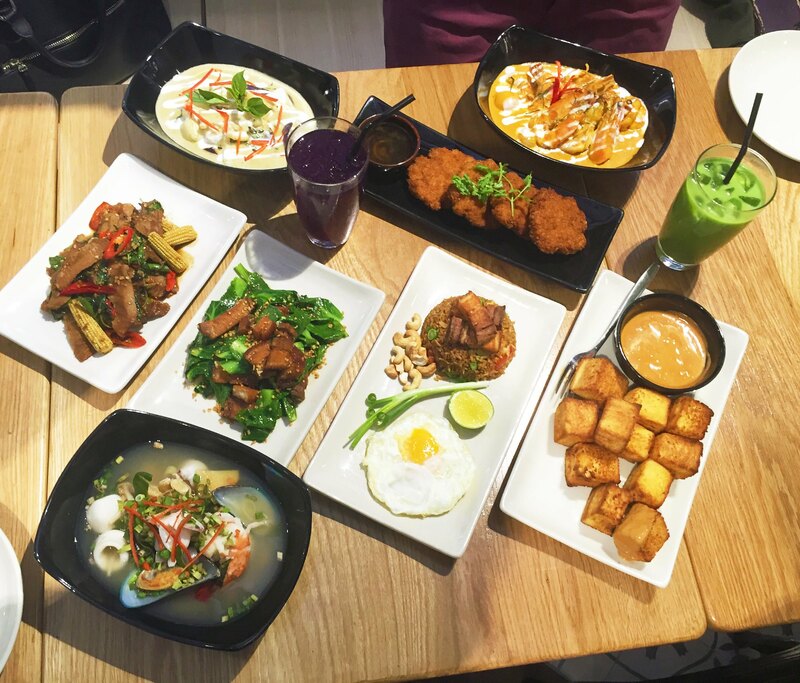 Cha Thai, though, serves cuisine from the central region, and in fact it can hardly get more central; Leah speaks proudly of familial associations with the Royal Palace, from which her grandmother got the recipes that she is now using and adapting. 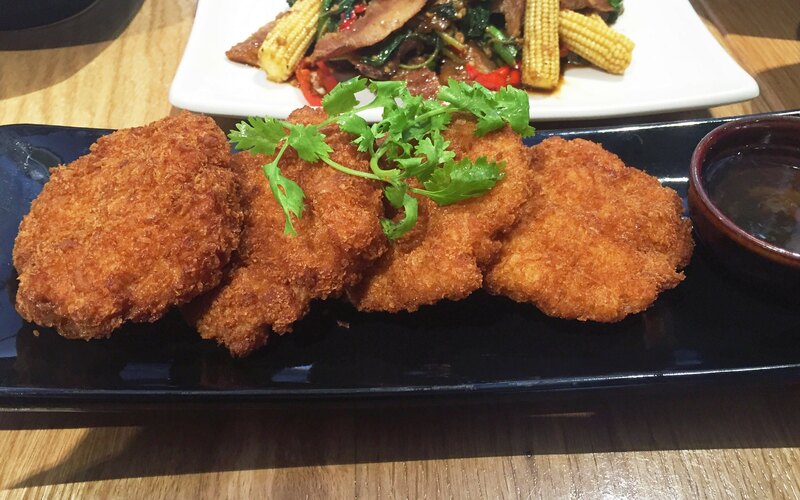 From the starters we have two items, the first being your standard issue Prawn Cakes ($15). Except they’re not standard issue - made in house from fresh tiger prawns, the cakes keep plenty of the prawn’s sinewy texture. Tiger prawns are quite the thing in Cha Thai, valued for their relative toughness and size; we will see a lot of them later too. The starter that really gets my attention, though, is the Nam Prik Khai Pu, which literally means dipping sauce of crab roe. It looks a little like your standard crudités platter, with batons of carrot, cucumber and slices of fried aubergine. 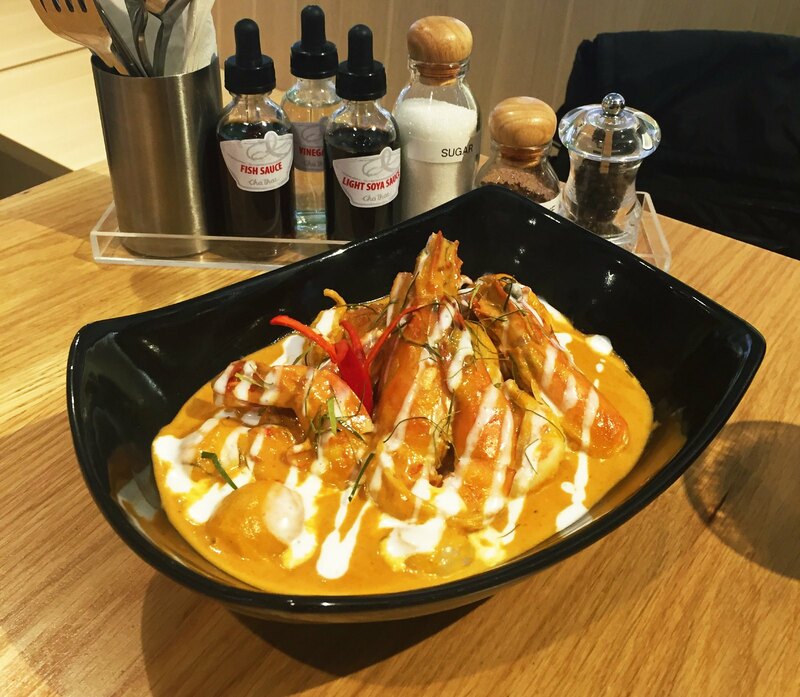 The sauce, though, is the definition of an appetiser - the typical Thai combination of refreshing acidity and spice leading the way, then behind it the pop and brine of crab roe. Curiously, crab roe is a lot cheaper in Singapore than in Thailand, and Leah says we should expect to pay double the price to have this nam prik in Bangkok. 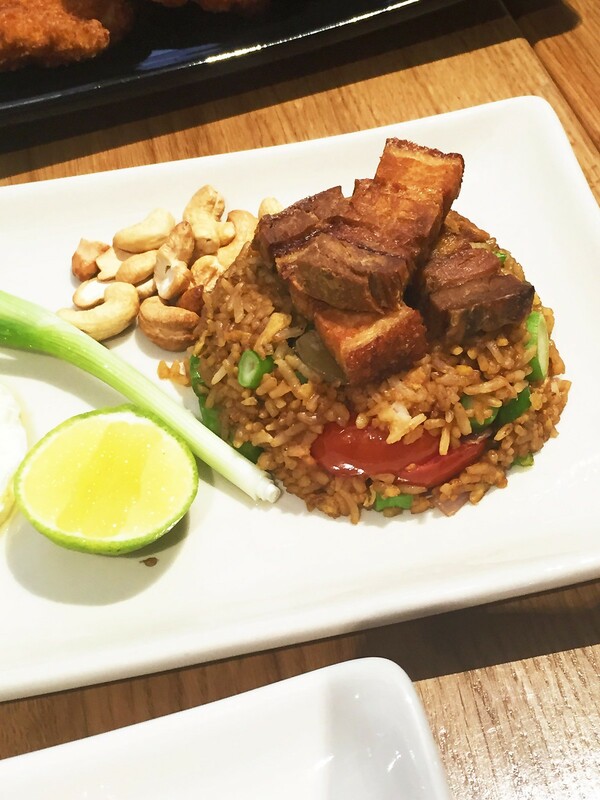 We had two varieties of fried rice - the Pineapple Fried Rice ($18), which is also given a generous serving of lap cheong, and the Train Fried Rice ($16) topped with crokking chunks of fried pork belly. 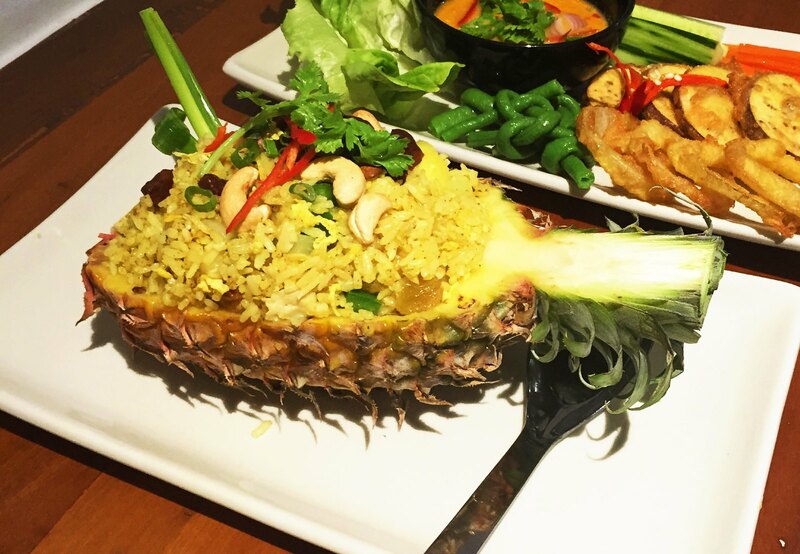 It is not bad, given that fried rice is rarely ever bad; the train fried rice is meant to evoke Thai comfort food, with little crunchy slices of kailan among the dark rice grains. The Green Curry ($18) at Cha Thai is actually rather mild; instead it is heavy with notes of coconut and lime leaves, in which generous helpings of bamboo shoots and tender fishballs nestle. 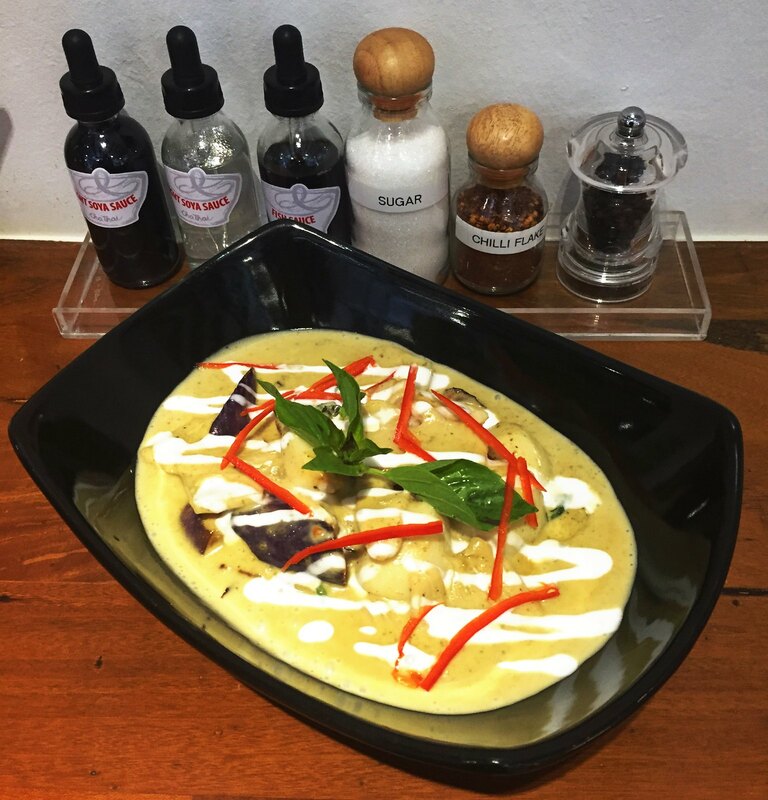 The liberal use of coconut cream is also enough to make the green curry viscous and thick. Panang Curry ($28) looks a lot more spicy than its green counterpart but also turns out to be mild and thick, and sweet as well. Leah explains that the tropical climate and abundance of sugar cane makes sweetness - a luxury in many cuisines from more temperate regions - a staple to central Thai cooking. Were it cooked ‘authentically’, she says, it would be way too sugary for Singaporean palates. Here, though, instead of being cloying, the sweetness is fruity, coming mainly from the addition of lychees. It plays well with the curry spice and also with more of the attractively curled up tiger prawns. 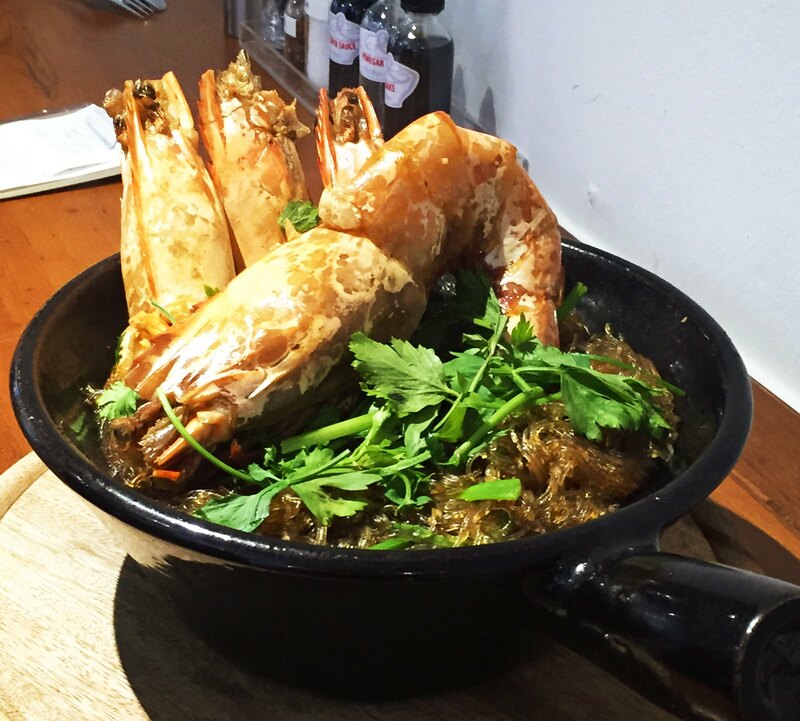 Those Tiger Prawns, though, have nothing on the giants which top the Glass Noodle Claypot ($159). While size in a tiger prawn tends to be a mixed virtue - the impressively big ones can also be resilient and hard to chew - careful cooking has rendered the meat crunchy but tender inside, filled with the aroma of prawn shells. The heads are too big for sucking, but the residue of roe and fat within is enough to scrape out with a spoon. It’s not good for you, but none of your senses will agree. The glass noodles themselves have also taken in the rest of that crustacean fragrance, glistening with just a little lard. This dish costs $159, which feels a little excessive if you’ve not seen the size of it, but what came to our table was enough to make the neighbouring table gawp and take pictures. Exercise your own judgement accordingly. 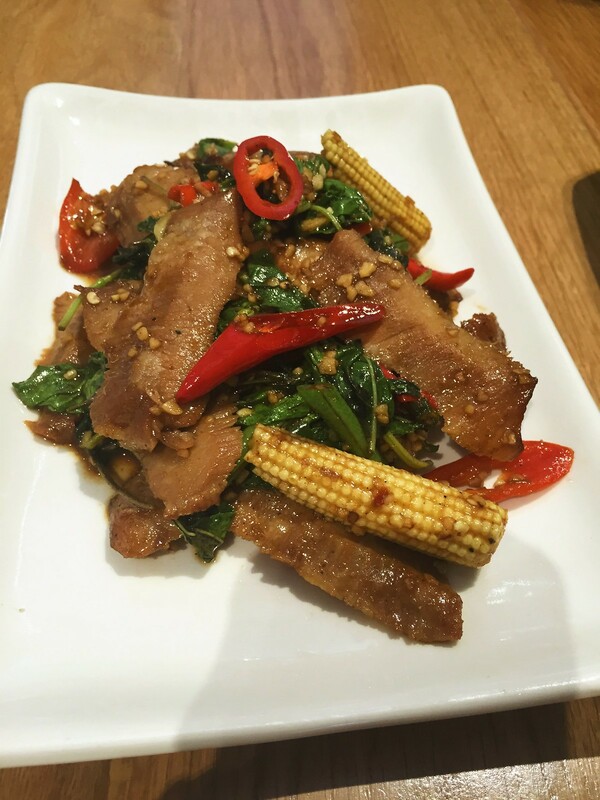 In an upmarket twist on krapow moo, the stir-fried minced pork with basil which would be a tired cliche were it not so tasty, Cha Thai has an option to substitute sliced and Roasted Pork Cheeks ($22) instead of mince. While mince fully soaks up the flavour of its sauce, oyster sauce and sugar and basil, the pork cheek slices here bring something else to the mix - a subtle char and a firm but fine texture. The appearance of cubes of toast bring an inevitable comparison to mind. Not to make any clear statements about who came up with this first, but in terms of quality, Cha Thai’s Toast Cubes ($8) and dip clearly have the upper hand. 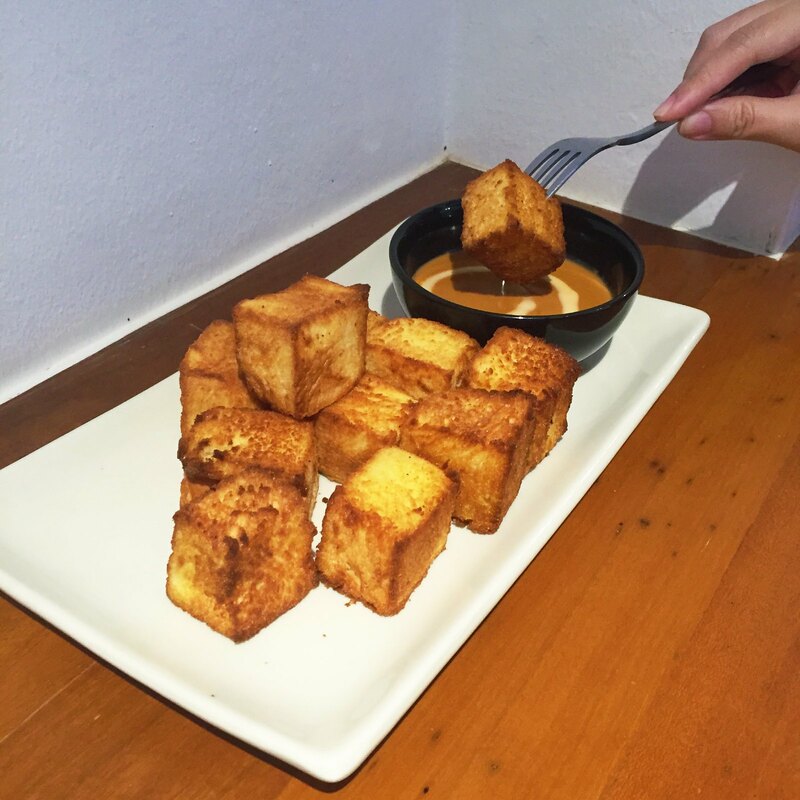 Despite their larger size, the cubes are nicely buttered and therefore moist to the core; the dip, made from milk tea powder with coconut cream, is thick enough to cling without dripping, almost like a custard. The coconut cream is content to be the soothing base for the tea’s herbal notes. 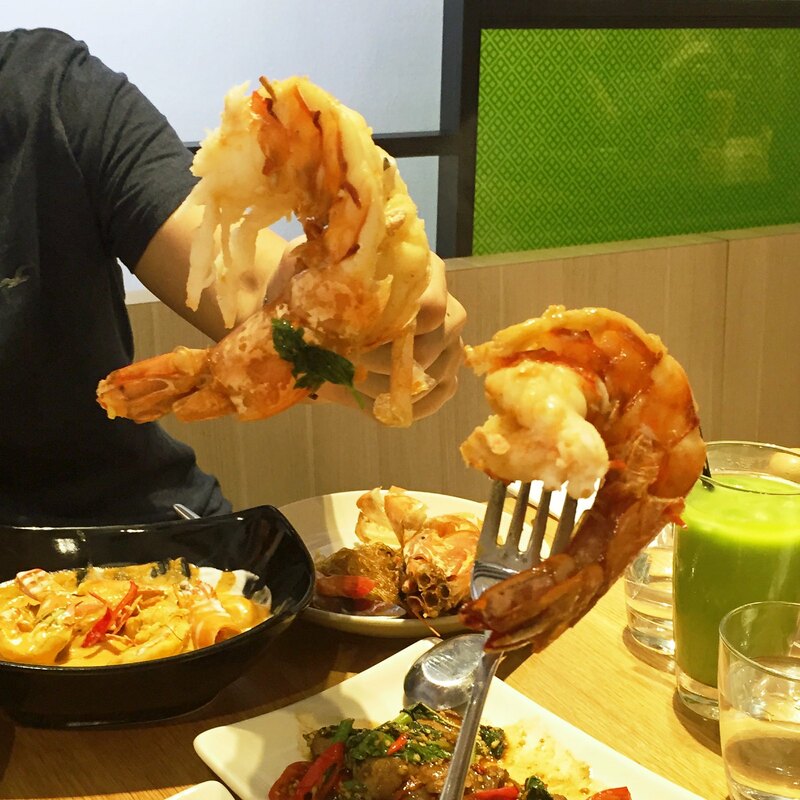 Just so we’re clear how giant those giant tiger prawns are. 3 to the kilogram. 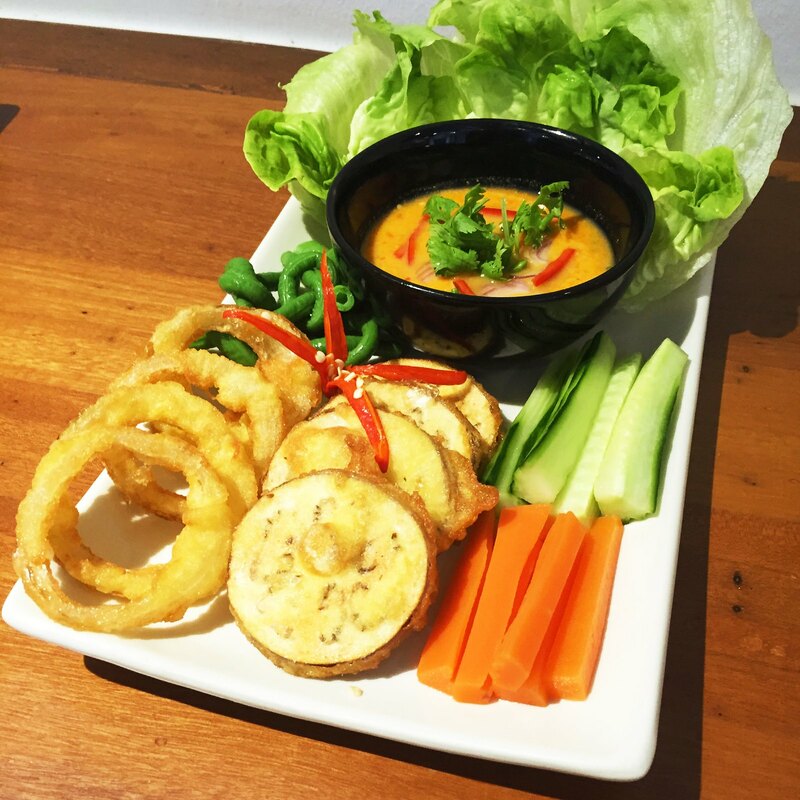 The quality of Cha Thai’s food is not just the result of old recipes, but also of plenty of effort. Seafood is sourced locally from our own kelongs for freshness; and everything, from the crab roe dip to the milk tea sauce, is made in house. Knowledge is key here - knowledge of traditions which still have not made an appearance in Singapore, such as the ubiquity of nam prik, or the ‘right’ method of adding acidity to a pad Thai (not solely limes, it turns out, but also unripe green mangoes for a more varied pinch). But pride is crucial too - from what Leah says about her family back home, she hardly needs to come down to Singapore and sweat it out in the local F&B scene. It was passion that first led her to a culinary school in France (where she met the head chef), and then set up in Singapore, first at Loaves Me in the SMU campus, then here at Cha Thai. This determination to run a restaurant does show, along with portions so generous you should always come with friends. At some point in the meal, picking up on the whole royal palace theme, one of the fellow writers asks if this is a meal fit for a prince. Me, I can’t imagine mounting an elephant and defending the kingdom after a meal like this. But getting on the train and bringing friends out to Cha Thai, that I can see myself doing. Guest Writer: Wilson’s perfect day consists of a good meal and a laptop, on a table, next to a window, overlooking the sea, in a rainstorm. You can see more of his reviews at his blog, Dear Babette. Alight at Telok Ayer MRT. Take Exit B. Cha Thai is on your left, across Telok Ayer Street. just want to be sure that it is not a typo here - "This dish costs $159, which feels a little excessive if you’ve not seen the size of it, but what came to our table was enough to make the neighbouring table gawp and take pictures." Not disputing the cost as it is probably worth its price. However if the glass noodles is priced as correctly written the restaurant is probably just out of range for myself. Yes the price is correct. It is only of the exception dish that is pricey. The other dishes are quite reasonably priced.